This post is in the theme “A Long Waltz Through Nerddom”. Read the first. July 26, New York: When I was in San Diego, I went searching used book stores to find this trilogy. Though I was ultimately unsuccessful (and turned again to Mr. Bezos), I made a different discovery: Holy crap, I read a lot of these books. 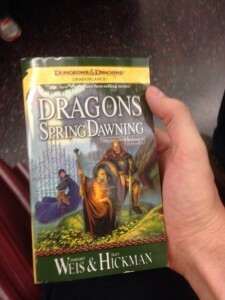 The Dragonlance Chronicles were published by the same folks who produced Dungeons and Dragons, and if you had you asked me I could have perhaps recalled two or three of their trilogies that I’d read. But no, in the dusty back aisle of this little used book store I had a terrifyingly embarrassing revelation: I must have read dozens of these pulpy little mass market paperbacks. Maybe over hundred total books. Trilogy after trilogy after trilogy. Heck, multiple trilogies that were derivative of the one I was seeking! 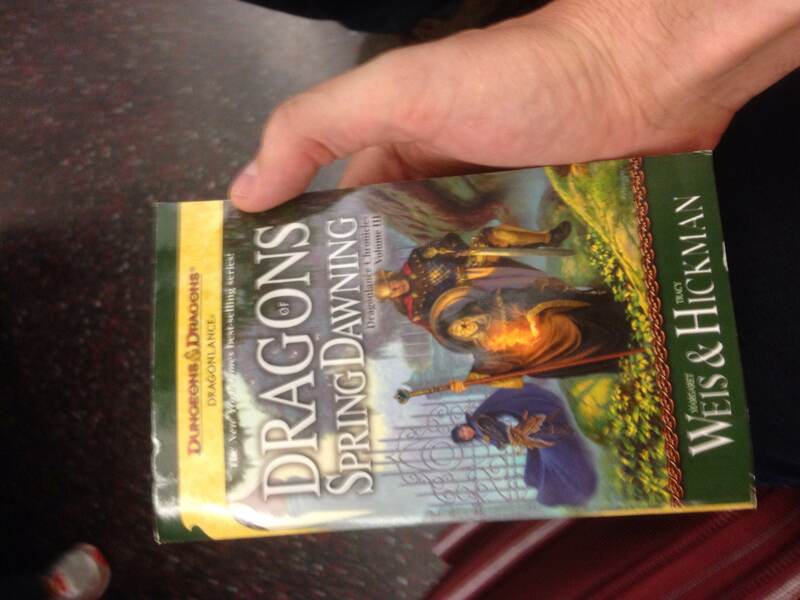 Let’s talk about The Dragonlance Chronicles. In them, a mismatched fellowship of companions quests across the face of a continent to play a decisive role in the ultimate battle between good and evil. There is an elf, a dwarf, a wizard, a warrior, and they are even led by half-elf (half-man). Sound familiar yet? I deliberately wanted to read this series after The Lord of the Rings so I could be aware of the derivations, and lo, but they are many. But The Dragonlance Chronicles are something else as well: an incredible advertisement for this universe of Dungeons and Dragons. There were a couple of worlds created around D&D and Dragonlance was one of them. It’s a distinct continent with its own history and cities and races and the trilogy takes you to every possible corner of that world. It’s the ultimate tour of the continent of Krynn and when you’re done reading it, why, call up the other “indoor kids” in your neighborhood and you can explore the world on your own. I actually kind of love that. These book aren’t incredible works of fiction. But they are a passport into an imaginary world that is designed specifically for you to explore it further, for you the reader to then have your own memorable adventures. The hallmarks of D&D are all over the story: the three moons for the three alignments of good, neutral, or evil; every other chapter is a new quest into a new dungeon; the party is of every character type from mage to rogue; and they meet just about every monster you could find in your own games. I would have loved that experience from so many books that I didn’t want to end— the chance to go live in that universe a while longer. With this and other trilogies, I took the opportunity. I played countless hours of D&D, owned so many of the books and manuals and dice. I thoroughly enjoyed re-reading these. I tore through them, often stayed up late on accident just to get through another chapter or two. It was just like being a teenager again, but for the difference that these are very embarrassing books to read on a plane or on the subway. Embarrass yourself on the subway and remember what it was like to be one of the indoor kids, with these three little page turners! This entry was posted in Books, Reviews and tagged A Long Waltz Through Nerddom on July 26, 2014 by magicandrew.